1. Diversions Build Land. Period. 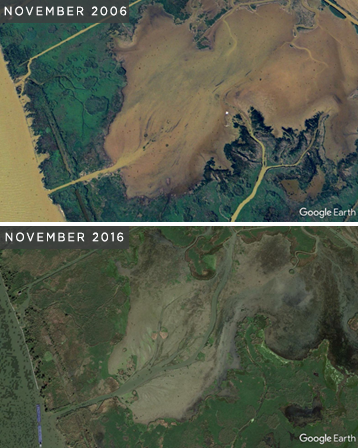 Over the past several months, we have been hearing a lot of claims about the potential effects of one of the largest coastal and ecosystem restoration projects ever to be undertaken in the state of Louisiana and perhaps the nation – the Mid-Barataria Sediment Diversion. This project is a cornerstone of Louisiana’s Coastal Master Plan and will build and maintain 30,000 acres over 50 years by reconnecting the Mississippi River to its wetlands. The people making these claims, some referencing scientific studies, have laid out their arguments as to why this project should not advance. One paper in particular is cited as scientific evidence that diversions will cause land loss. But, as we will demonstrate, a closer read of that paper, and much of the rest of the evidence assembled in opposition, reveals that the facts simply don’t add up on these claims. Each year, as the Barataria Basin continues to lose around 1,300 acres of coastal wetlands, levees along the Mississippi River push millions of tons of sediment out into the deep water of the Gulf of Mexico beyond where it is most needed. [i] This sad irony has existed for too long and continues to threaten communities, critical wildlife habitat and vital national infrastructure. The river built Plaquemines Parish, and the parish’s only hope for continuing to survive in the face of hurricanes, saltwater intrusion and sea level rise is using the river to again build and maintain land. Why then, have some concluded that diversions will cause, not curb, land loss? They are understandably but inaccurately pointing to land loss experienced in the Breton Basin following Hurricane Katrina, including the area around the Caernarvon Freshwater Diversion. We must bear in mind, however, that unlike the Caernarvon Freshwater Diversion, the sediment diversions proposed in the Coastal Master Plan will deliver a significantly higher volume of land-building sediment throughout the entire basin, which will in turn build and maintain land at a much larger scale. Why are so many quick to blame the Caernarvon Freshwater Diversion for marsh loss? Hurricane Katrina ripped up much of the marsh in the Caernarvon Diversion outflow area. Hurricane Katrina, like many hurricanes in the past, caused severe damage to marshes with weak organic soil that happened to be right in the path of its strong storm surge and waves. The weakness in those marshes was largely caused by decades of sediment starvation, not by a few years of freshwater inputs from the Caernarvon Freshwater Diversion. We only need to look at what happened during Hurricane Betsy, a weaker storm that struck much farther west in 1965, to see that the same type of damage occurred. The hurricane tore up and rolled up large strips of marsh, leaving open water. 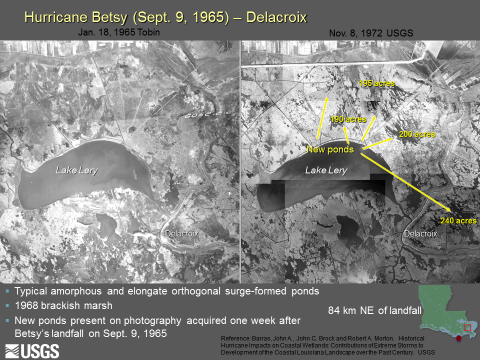 [v],[vi] The graphics below show the damage from Hurricane Betsy, which struck 34 years before the Caernarvon Diversion was even opened. Fresh water was not the cause, since there was no fresh water flowing into the basin in 1965. The cause was structural weakness—marsh plants growing in peat, rather than in heavier, firmer sand, silts and clays. Unfortunately, people are falsely blaming damage to sediment-starved wetlands by one of the most destructive hurricanes on record on a small freshwater diversion project. The reality is that wetlands starved of sediment, fresh water and nutrients, as in many areas across our coast, are more vulnerable to damage by large hurricanes. The wetlands of Louisiana were built by the sediment carried by the mighty Mississippi River. The state’s coastal wetlands can neither be rebuilt nor sustained, over the long term, without sediment from the river. Period. The closing of distributary channels like Bayou Lafourche, and levees built for flood control and channel projects for navigation pinned the river in place, cutting off the flow of sediment to much of Louisiana’s coast. Over time, the lack of sediment, sinking land and rising seas, canals and other factors have contributed to wide-scale land loss. Today, with the river levees in place, there is little sediment input into coastal wetlands, and the survival of wetlands in most areas is dependent on the growth of roots and the accumulation of leaves and other organic material increasing the elevation of the wetland at a pace that matches sinking land and rising sea levels. [vii] In many parts of Louisiana, wetlands can’t keep pace and soon disappear beneath the water. But, just keeping pace with sea level isn’t always enough, soils also need to be strong. Some cite a scientific paper titled “Hurricane-induced failure of low salinity wetlands” to back their claims that freshwater marshes are inherently weaker than saltwater or brackish marshes against storm surge, but the findings of this paper have largely been misrepresented. What this paper actually concluded was that marshes with low mineral sediment input, like those near the Caernarvon Freshwater Diversion before Katrina, are weaker and more vulnerable to storms because of their lack of sediment. The often-referenced Caernarvon Freshwater Diversion has built over 700 acres of land near the outfall area despite not being designed or operated to do so. Nonetheless, because it is a small freshwater diversion and has been not operated to capture sediment, most of the marshes in Breton Basin remain sediment-poor. It’s not an issue of fresh water, but a lack of sediment. Marsh soils that are mostly organic (i.e., lack sediment from the river) are often weaker due to the air space between the roots, leaving them more vulnerable to erosion by storm surge. In contrast, marshes with mineral sediment – delivered from the river – have denser, stronger soils and are more resilient. In parts of Louisiana not connected to the river and far from the Gulf, often in the upper parts of the coastal basins, freshwater marshes often have lower sediment input and, as a result, lower soil strength. But the same is true of brackish marshes with little mineral sediment input. The issue is not salinity or even vegetation type. [vii] The issue is the amount of mineral soil versus the amount of organic soil. Mineral sediment is needed to build and sustain strong marsh soils that can withstand storm surge. Sand dredged from the river bottom can and is being used to restore wetlands, but only dredging this material is not enough. Only around 20 percent of the sediment that the river carries is sand, the rest is silt and clays, which stay in suspension, never settling onto the bottom where it could be sucked up by dredges. [xiii] There is less sediment in the river than there used to be, and by only focusing on dredging we would be missing out on most of the sediment that the river carries suspended in the water column. While sand is important for rebuilding wetlands, silts and clays are also needed to help sustain existing wetlands that will otherwise be lost. This isn’t to say that dredging and creating marsh isn’t important. It is, but the farther from the sand source you get the more costly the project becomes. This is why the reconnection of the river to the wetlands is so important. Diversions can extend the lifespan of marsh creation projects, build new wetlands and sustain existing wetlands. Without diversions, those fine sediments slip by the wetlands and into the Gulf, creating the huge brown plume we see in satellite photos at the mouth of the river. The Mid-Barataria Sediment Diversion is one of the most studied and modeled projects in our state’s history, and every coastal plan dating back 40 years has said diversions are critical to the future of our entire region. Far from an untested idea, one only needs to look at aerial maps or visit places receiving regular sediment and freshwater input from the river to see the opportunity that exists through sediment diversions. Another recent tactic is to propose that the Mid-Barataria Sediment Diversion poses risks similar to those created by the dredging of the Mississippi River Gulf Outlet. It is true that both projects involved dredging canals, but there the similarity ends. The 76-mile long Mississippi River Gulf Outlet was dredged in the 1950s and 1960s to provide a shortcut from the Gulf of Mexico to the Port of New Orleans through swamp and marsh. This massive shipping channel, kept dredged to a minimum depth of 36 feet, caused significant saltwater intrusion into interior wetlands, creating land loss and also exacerbating storm surge during hurricanes. Because no one maintained the banks, it eventually increased in width from 650 feet to over 3,000 feet in some areas. The Mid-Barataria Sediment Diversion will be a much shorter, narrower and shallower canal, dug through dry ground—not swamp or marsh. Unlike the MRGO, the banks will be armored and flanked by guide levees that will prevent erosion and widening and features that will efficiently direct sediment and fresh water where they are needed. This channel will also tie into the river levee system with structures to maintain the hurricane and river levee protection system. 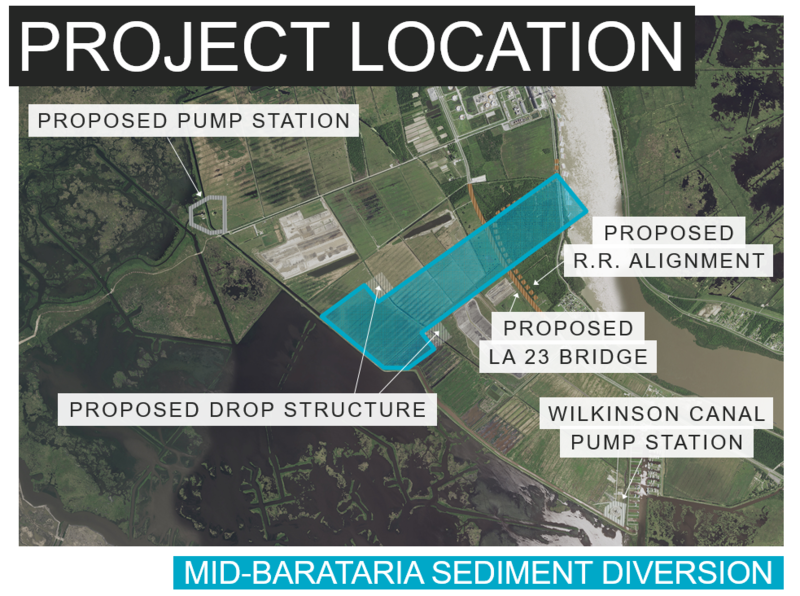 See a conceptual video of what construction of the Mid-Barataria Sediment Diversion would entail here. In short, MRGO destroyed land through bank erosion and saltwater intrusion; the Mid-Barataria Sediment Diversion will build and maintain land. Comparing a massive navigation channel like MRGO to a sediment diversion is comparing apples to oranges. Some have argued that sediment diversions will cause so-called low-oxygen dead zones. Again, this claim needs to be examined. The Gulf dead zone develops when runoff of nutrients added to fertilize crops in the Midwest are carried to the deep Gulf. The excess fertilizers stimulate the growth of algae in surface waters that then settle to the Gulf floor. Oxygen in those bottom areas is used up as bacteria breaks down the dead algae. Because there is typically little mixing in the summer between layers of deep salty water at the bottom and oxygen-rich fresher waters at the surface, a low oxygen area, or “dead zone,” develops near the bottom. Each year, hurricanes or the frontal passages of fall and winter mix the Gulf’s waters, and the dead zone dissolves. We hope this helps answer some of the false claims that have been floating around. The Mid-Barataria and Mid-Breton Sediment Diversions are too critical to the future of Plaquemines Parish, the State of Louisiana and our entire nation to let politics and false narratives interfere with science. If you have questions or want to learn more about these vital projects and help advocate for them, contact us here. If you hear other claims that you would like more background on, please let us know. [i] Couvillion, B.R., Beck, Holly, Schoolmaster, Donald, and Fischer, Michelle, 2017, Land area change in coastal Louisiana 1932 to 2016: U.S. Geological Survey Scientific Investigations Map 3381, 16 p. pamphlet, https://doi.org/10.3133/ sim3381. [ii] Allison, Mead A., Charles R. Demas, Bruce A. Ebersole, Barbara A. Kleiss, Charles D. Little, Ehab A. Meselhe, Nancy J. Powell, Thad C. Pratt, and Brian M. Vosburg. 2012. “A Water and Sediment Budget for the Lower Mississippi–Atchafalaya River in Flood Years 2008–2010: Implications for Sediment Discharge to the Oceans and Coastal Restoration in Louisiana.” Journal of Hydrology 432–433 (April): 84–97. [iii] Baker, A., T. Henkel, J. Lopez and E. Boyd. 2011. A Project of the Lake Pontchartrain Basin Foundation and the Coalition to Restore Coastal Louisiana. Lake Pontchartrain Basin Foundation. [vi] Barras, J.A., 2009, Land area change and overview of major hurricane impacts in coastal Louisiana, 2004-08: U.S. Geological Survey Scientific Investigations Map 3080, scale 1:250,000, 6 p. pamphlet. [vii] Morris, J.T., D.C. Barber, J.C. Callaway, R. Chambers, S.C. Hagen, C.S. Hopkinson, B.J. Johnson, P. Megonigal, S.C. Neubauer, T. Troxler and C. Wigand. 2016. Contributions of Organic and Inorganic Matter to Sediment Volume and Accretion in Tidal Wetlands at Steady State. Earth’s Future, 4, 110-121. [viii] Sasser, C.E., E. Evers-Hebert, G.O. Holm Jr., B. Milan, J.B. Sasser, E.F. Peterson and R.D. DeLaune. 2017. Relationships of Marsh Soil Strength to Belowground Vegetation Biomass in Louisiana Coastal Marshes. Wetlands: 38 (2), 401-409. [ix] Robert A. Morton and John A. Barras. 2011. 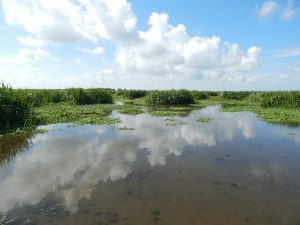 Hurricane Impacts on Coastal Wetlands: A Half-Century Record of Storm-Generated Features from Southern Louisiana. Journal of Coastal Research: 27 (6A), 27 – 43. [x] Couvillion, B.R., Beck, Holly, Schoolmaster, Donald, and Fischer, Michelle, 2017, Land area change in coastal Louisiana 1932 to 2016: U.S. Geological Survey Scientific Investigations Map 3381, 16 p. pamphlet, https://doi.org/10.3133/ sim3381. [xi] Amer, R., A.S. Kolker and A. Muscietta. 2017. Propensity for Erosion and Deposition in a Deltaic Wetland Complex: Implications for River Management and Coastal Restoration. 199, 39-50. [xii] Smith, J. E., S.J. Bentley, G.A. Snedden and C. White. 2015. What Role do Hurricanes Play in Sediment Delivery to Subsiding River Deltas? Sci. Rep. 5, 17582; doi: 10.1038/srep17582. [xiii] Allison, Mead A., Charles R. Demas, Bruce A. Ebersole, Barbara A. Kleiss, Charles D. Little, Ehab A. Meselhe, Nancy J. Powell, Thad C. Pratt, and Brian M. Vosburg. 2012. “A Water and Sediment Budget for the Lower Mississippi–Atchafalaya River in Flood Years 2008–2010: Implications for Sediment Discharge to the Oceans and Coastal Restoration in Louisiana.” Journal of Hydrology 432–433 (April): 84–97. [xv] Louisiana Coastal Wetlands Conservation and Restoration Task Force and the Wetlands. Conservation and Restoration Authority. 1998. Coast 2050: Toward a Sustainable Coastal Louisiana. Louisiana Department of Natural Resources. Baton Rouge, La. 161 p.
[xvi] Day, Jr., J.W., A. Y. Arancibia, W.J. Mitsch, A. L. Lara-Dominguez, J.N. Day, J-Y. Ko, R. Lane, J. Lindsey, D.Z. Lomeli. 2003. Using Ecotechnology to Address Water Quality and Wetland Habitat Loss Problems in the Mississippi Basin: Hierarchical Approach. 22, 135-159. [xvii]Peyronnin, N.S., Caffey, Rex H., Cowan, James H., Justic, Dubravko, Kolker, Alexander S., Laska, Shirley B., McCorquodale, Alex, Melancon, Earl, Nyman, John A., Twilley, Robert R., Visser, Jenneke M., White, John R., and Wilkins James G., 2017, Optimizing Sediment Diversion Operations: Working Group Recommendations for Integrating Complex Ecological and Social Landscape Interactions. Water, 9(6), 368. [xviii]Bush, Natalie, Bush, Edward, Sokolova, Yuliya, Bush, Nathan, and Blanchard, Pamela, 2018, Utilizing the Physiological Adaptation Mechanisms of Coastal Plants for Vegetative Restoration of Barrier Islands. Ocean & Coastal Management, 161, 222-227.